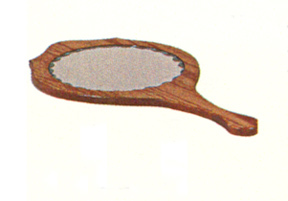 #383 Hand Mirror - Shown here in solid oak with optional scalloped edges. For those who may not know, a scalloped edge refers to the “frilly” edge between the mirror glass and the wood frame of the mirror. Otherwise the edge between the mirror glass and the wood frame would be smooth.